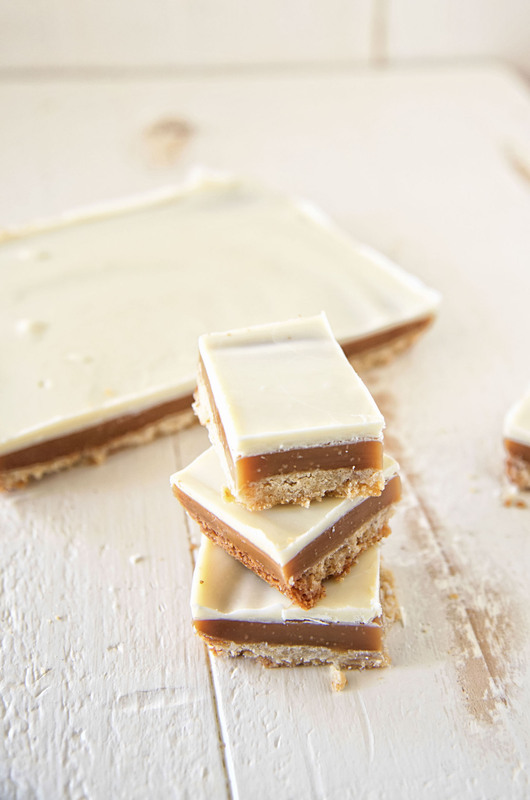 Root Beer Float Caramel Bars: Buttery vanilla bean shortbread covered in root beer flavored caramel and topped with white chocolate. A few years ago you may recall that Kita of Pass the Sushi and Erin of The Spiffy Cookie came and stayed at my house for a foodie weekend. It all started because Erin saw that my town had a root beer store and wanted to go. She’s beyond obsessed with root beer and has amassed an amazing collection. Whenever I think of root beer I think of her. This weekend she gets married which of course got me thinking about root beer. I had wanted for quite some time now to make root beer float caramels. That is what I thought I was going to make. Right up until I went to make it and at the last minute I thought about making them into a bar cookie. If you don’t own a candy thermometer yet you need to (I use this one). 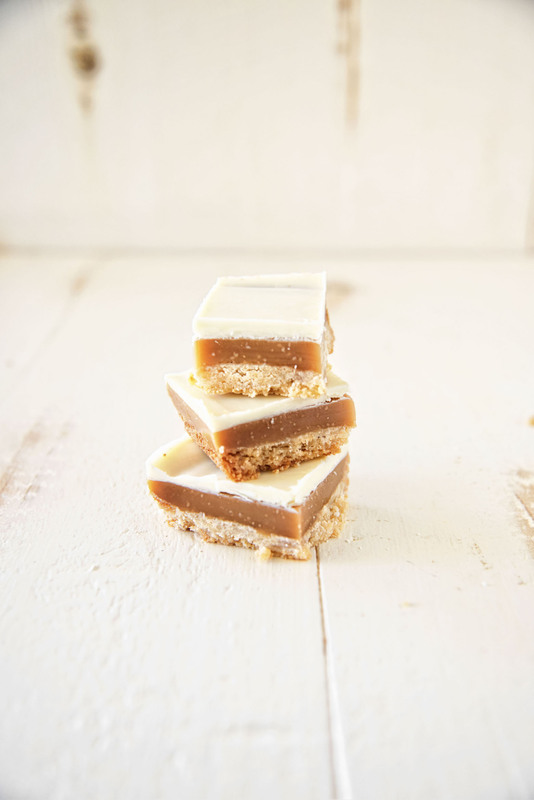 Fall is coming and that means more and more caramel recipes will be on there that you need to make. Best wishes to Erin and Bob…here are to many happy years together and lots of root beer floats together. Prepare a 9×13″ baking dish by lining with parchment paper so as able to lift the bars out when done. Cream together the butter, powdered sugar, salt, and vanilla until smooth. Add the flour and beat on medium speed until crumbly dough is formed. Press dough evenly into the bottom of your prepared baking dish. Poke several holes in dough with a fork, covering the entire surface. Bake for 35-45 minutes until top is golden brown. Set aside to cool. Combine root beer, sugar and corn syrup in a deep saucepan and bring to a boil over medium high heat. Normally with caramel you would be heating until it formed a golden brown color but the root beer is already brown. So allow the ingredients to turn to liquid, stirring occasionally. Just make sure there are no clumps of sugar. In a microwave safe bowl heat butter, cream, and salt for about 30 seconds, or until butter has melted. Slowly add cream mixture to pan. It will bubble up so stand back. Stir in the vanilla and root beer extract with a wooden spoon and return the caramel to medium low heat. Stirring occasionally, cook for about 10 minutes until a candy thermometer reads 248F. 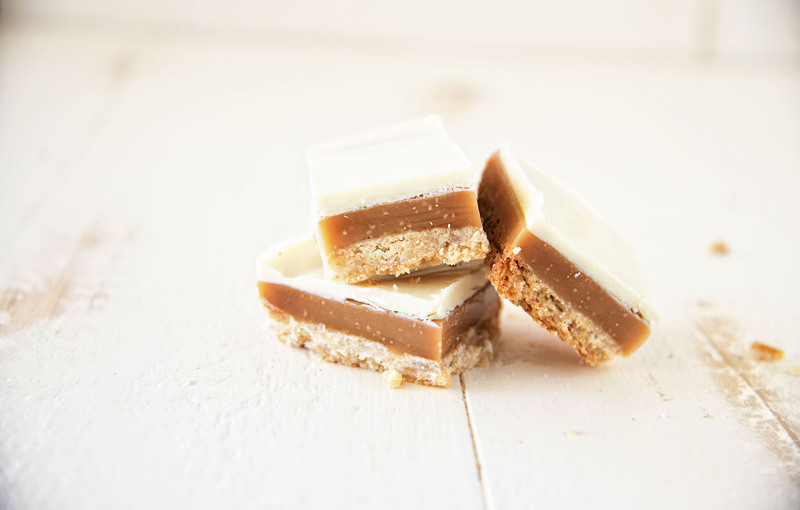 Once desired temperature is reached, remove from heat and carefully pour caramel over your cooled shortbread. Do not scrape sides of saucepan, this caramel will be slightly overdone and can be discarded. Let cool at room temperature until the caramel is set. You can place in fridge but it will make the chocolate harder to spread as the cold caramel will cause it to seize. Melt white chocolate chips and oil in a microwave safe bowl. Stir until it gives it a shiny smooth appearance. With an offset spatula apply a thin layer of the chocolate on top of the caramel layer. Once chocolate has set cut bars with a knife to desired size. I was in awe of her collection. And how many she bought when she was here. We had to ship them back home to her.